It’s heart-warming that someone so young recognises the importance of giving and helping others – we see a bright future for Annie. 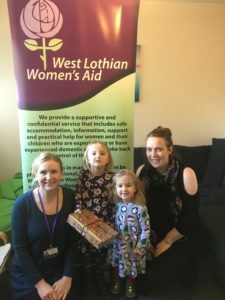 Annie (aged 5) visited with her sister Mairi (aged 2) and Mum to drop of the present, beautifully wrapped, in plenty time before the big day on the 25th! Here she is with her little sister, our manager and a women’s support worker.